Let's see the 40 pin Dual Inline Package (DIP) of microcontroller integrated circuit with externally connected power supply and oscillator. Pins 1-8: These pins belongs to Port 1 of microcontroller. Port 1 is used as domestically pulled up, quasi bi directional input/output port. 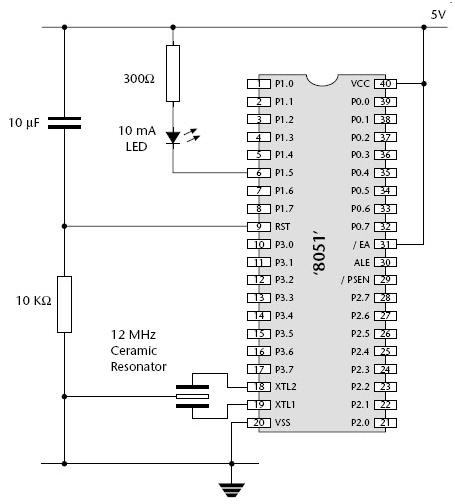 Pin 9: It is a RESET pin which is utilized to set the microcontroller 8051 to its primary value. During the beginning of an application the RESET pin is to be set elevated for two machine rotations. Pins 10-17: These pins belong to Port 3 of microcontroller. Port 3 can be used for number of functions such as timer input, interrupts, serial communication indicator for transmitting (TxD) and receiving (RxD). It is also known as domestic pull up port with quasi bi direction port embedded within. Pins 18 and 19: These pins are generally be used for interfacing outer crystal oscillator with given system clock. Pin 20: This pin titled as Vss. It symbolizes ground voltage or 0 V is connected to this pin of microcontroller. Pin 21-28: These pins belong to port 2 of microcontroller. Port 2 can be used as Input/output port, senior order address bus are multiplexed with this quasi bi directional port. Pin 29: This pin belongs to Program Store Enable or PSEN. It is used for interpreting the sign from outer program memory. Pin 30: This pin belongs to External Access or EA input is used for permit or prohibits outer memory interfacing. If there is no outer memory need, this pin is set to high by linking it with supply voltage . Pin 31: This pin belongs to Address Latch Enable or ALE is used for de-multiplexing the address data indication of port 0 for outer memory interfacing. Pin 32-39: These pins belong to Port 0 of the microcontroller. Port 0 can be used as input/output port, lower order address and data bus signals are multiplexed with this port. This pin act as bi directional Input/output port and outer connected pull up resistors are necessary for utilizing these ports as Input/output. Pin 40: This pin is used to provide power supply to the circuit.